I must have been living under a rock or maybe I hit my head on a rock and developed amnesia, because I’m not sure why I’ve waited so long to buy my first Native War Paints (NWP). Welp, now that I have made my initial purchase, I want to share my swatches and review of Heliotrope in the Garden and Watermelon Bubblegum (sold out). 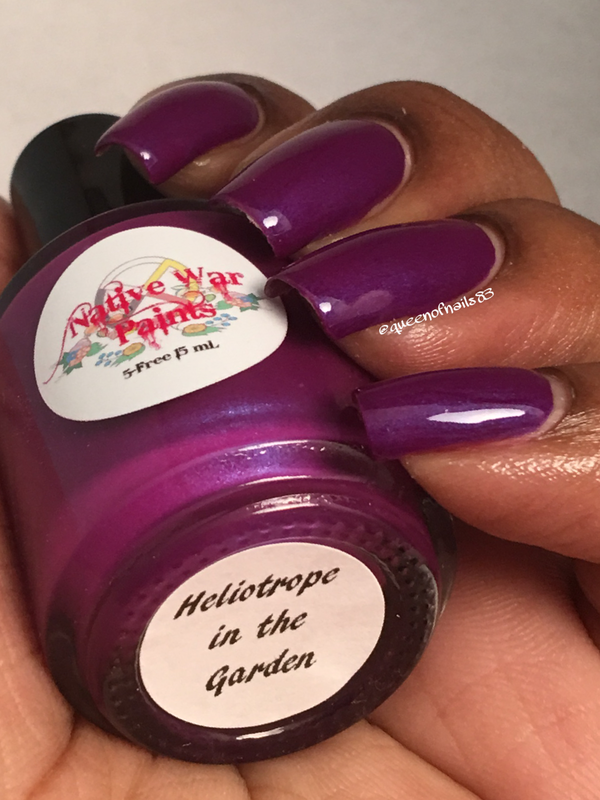 Heliotrope in the Garden is part of the Purple Reign Collection and while all of them are beautiful, this one caught my eye from all the gorgeous swatches I had seen in FB and IG. This purple has red undertones with a blue shimmer. Shown here in 2 coats, this polish is completely opaque in 2-3 coats. 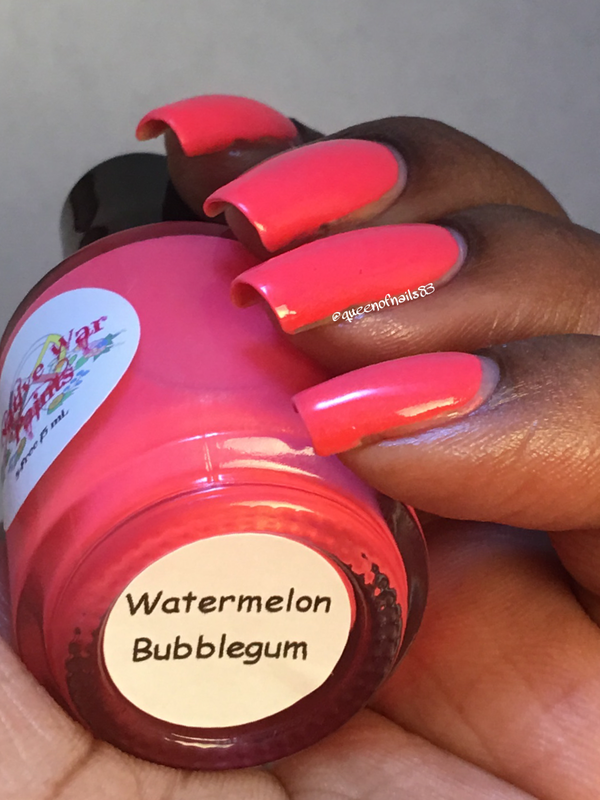 Originally released for the March 2016 Candy Shop Monthly Mystery Box, Watermelon Bubblegum is currently sold out in the clearance section of the NWP site. 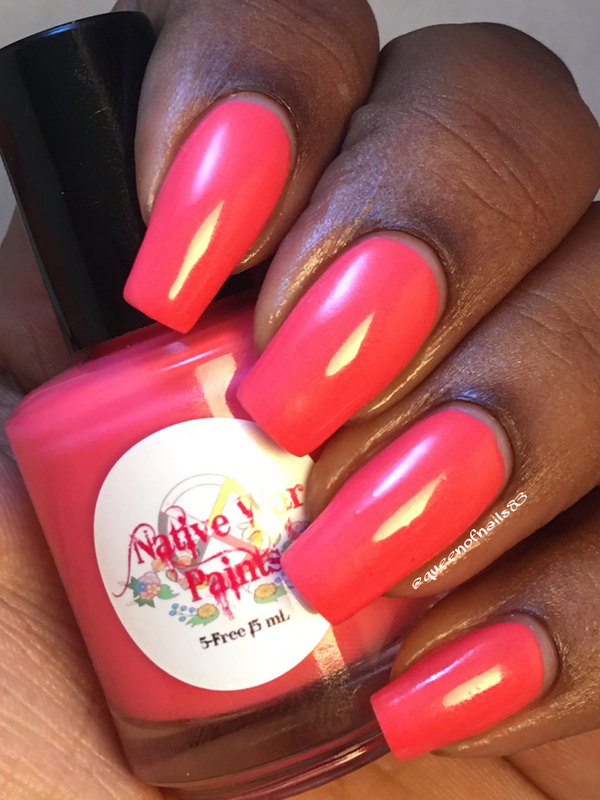 This neon-ish, coral with a beautiful orange shimmer is a must have for the summer. Shown here in 2 coats, this polish is completely opaque in 2-3 coats. I guess it goes without saying that this will not be my last purchase from NWP. What are some of your favorites Native War Paints? For you purple polish fanatics, YOU MUST HAVE Heliotrope in the Garden. I hope you all like my swatches and review of these of amazing polishes and join me back here for more. Hey, I’m out of town this weekend but couldn’t leave you with out a Monday post! So todays post is an old challenge mani courtesy of When Colors Collide on FB. This color challenge based group, allows members create a mani incorporating the colors given. Challenges run every two weeks and at the end, a collage is created and posted to IG. Its a lot of fun so make sure to head on over to join. I didn’t do pictures at each step, so I’m going to do my best to describe what I did. Assume step #6 from Manicure Must Haves is complete and this is step #7. While the base coat was still a little tacky, I sponged on the polish to each finger one at a time. Once I was happy with the diagonal ombre, I applied a coat of Seche Vite and allowed to dry. During my dry time, I selected my stamping plate and polish. Once the polish was dry, I stamped my design on to each finger, removed latex and cleaned up. Finally, I applied my last coat of Seche Vite and allowed to dry. Couldn’t forget to oil up and take pictures. Again, my bad for not getting pictures each step of the way, hopefully you could follow long. what are some of your favorite color combos? I hope you enjoyed this quick tutorial and will join me for the next edition in Challenge Nails. Eeeekkkkkk!!! I’m so excited to bring you this interview!!! You may remember in Ladies Behind the Polish, I talked about having the opportunity to swatch for a few amazing indie brands? You remember, I told you to stay tuned for my in-depth interviews with them so you could find out all about the brands that we have come to know and love? Ringing bells now, good, because today I have another special treat in my interview series, the duo from Jior Coutour, Sacha Junique and Ari Jiordan!!!!! There’s something special about a mother and daughter team, I just cant put my finger on it at the moment but these ladies have IT! What started as selling polish at home parties and on Facebook in 2010, quickly grew to an empire for Sacha and Ari and this mother-daughter duo have never looked back. Besides beauty, talent, intelligence and a go-getter attitude, these 2 make beautiful polishes and offer a wide range of products including top & base coats, glass nail files & cuticle pushers, sugar scrubs and skin butter. Recently, I worked with Sacha to create a wonderful custom gray polish for May’s Brain Tumor Awareness month. The polish, appropriately named Michael, is remembrance of my dad who passed in 2014 from brain cancer. I was looking for the perfect gray color and she captured it, so I say all that to say, if you need customs, Jior Coutour is an amazing brand to work with. So lets jump right into the fun that you came here for. without further ado, allow me to present Sacha Junique and Ari Jiordan!!!!!!! Q: Why did you decide to start a nail polish line? Sacha: Since Ari was about 3 or 4, we were getting weekly mani/pedis. When all the info about the “big 3” came into the news, we stopped going. Ari: I really missed having that time with my mom. I was around 5 or 6 years old and I remember saying to my mom, “If only we could make our own safe polishes.” That’s how Jior Couture began. Q: What makes your brand different? Ari: When it comes to naming and creating new lacquers, my mom lets me have so much creative freedom. We’re truly a mother-daughter team, we have business meetings where we talk about 1 yr, 5 yr and 10 yr plans. We go over budgets, and new collections. We put so much thought and love into what we do. When we get emails from our customers saying how much they love their Jior mail, from the product to our signature wrapping paper, it’s great! I know we’re doing something great. We’ve also started ‘Swatcher Spotlight’. With this, we get to showcase our absolutely talented swatchers AND donate to charity. Sacha: What other nail polish line has a 12 year old co-owner? Ari: I love sewing and I make little animals and my own skirts and dresses. Q: What advice/tips you give someone wanting to start their own polish company? Sacha: Understand that it can be equally fun, rewarding and HARD. Do as much research as you can before starting. Ari: When we started, there wasn’t much out there as far as information. Now the sky’s the limit with research. Sacha: aww, I’ll do Ari. Brilliant, Creative, Focused, Regal, Creative, Loyal, Graceful, Beautiful. Yikes, that was more than 5, Sorry. I can’t say enough about my girl. Ari: Strength- I’m quite resourceful. Weakness- Anything I’m not good at eventually becomes a strength. So I don’t like to call them weaknesses. Oh, so you know, that ‘IT’ I was referring to before, INCREDIBLE, MARVELOUS, WONDERFUL! I could go on and on and on but I’m sure you get the point. Whether you talk about Sacha and Ari or Jior Coutour, at some point these words will be used. If you haven’t already had pleasure of supporting these ladies and/or the polish/products you purchased still sit untried, don’t wait any longer, buy and use, you won’t be sorry. 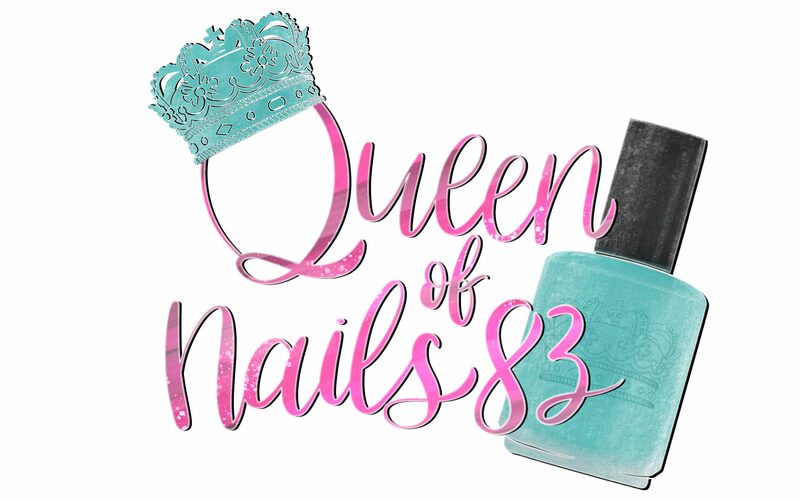 Stay in the know about discounts, sales, giveaways, group customs and so much more by joining the Jior Couture Polish Mavens on Facebook and Instagram. Hey y’all, I’m at it again…hehehehe. I have worked with multiple FB groups and IG to find the best Women of Color (WOC) polish swatchers and bloggers. While this list is not to discredit anyone or their work, I thought it was about time we had a list of WOC that are available. This is simply a means to assist makers with a list of WOC that would love to work with them to show their polishes on a rage of skin tones. More and more makers are adding WOC to their core list of swatchers/blogger and for that we are thankful. 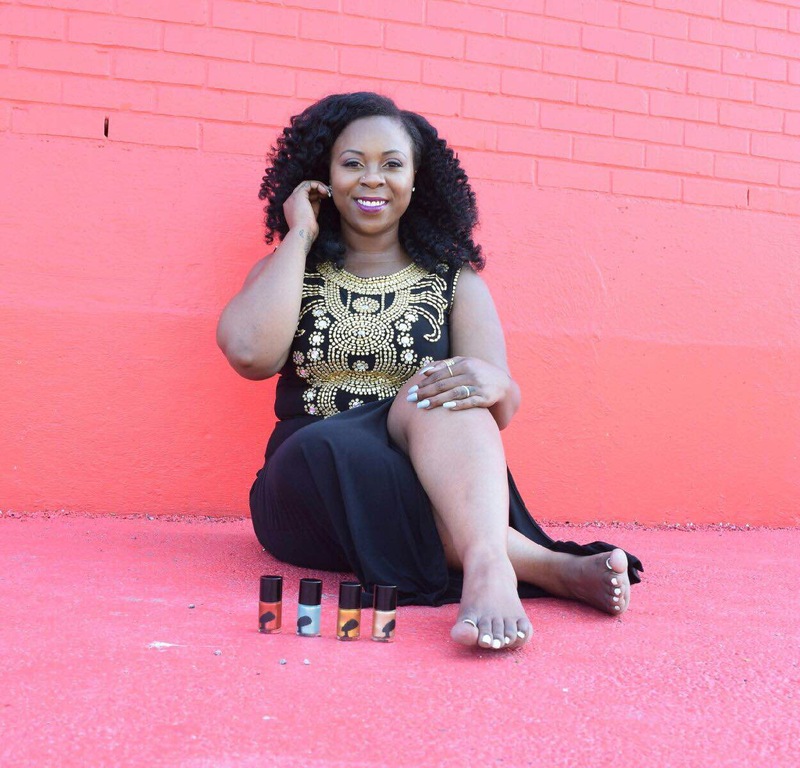 Too many times polishes are destashed or simply not purchased because its believed that the color or shade didn’t or wouldn’t compliment skin tone. By bridging the gap and providing WOC, hopefully we can avoid this travesty and #buyallthepolish!!! Well makers, here we are, waiting and willing! As I continue to get emails of WOC swatchers/bloggers, I will continue to bring you up to date info. So stay tuned for upcoming posts as we continue to find more and more talented ladies. If you are a WOC swatcher/blogger, please email me your links to where you post your work. Or, if you are listed and your info needs to be updated or links are not working, PLEASE REACH OUT TO ME via email. Have you been seeing swatch photos of new collections and releases on IG, FB, YouTube and blogs, etc describing formulas, drying time, opacity? Do you then wonder how you too can become a swatcher/blogger? Or said, “I want to do that!” If you said ‘yes’, then this post is for you. I recently asked indie polish makers on FB to answer some questions I thought would be helpful to aspiring swatchers/bloggers. So lets go deeper inside the mad minds of those brands we have come to know and love, shall we, and find out what indie polish makers want you to know. First, I thought it would be helpful if I included SOME links to swatcher/blogger applications to get you started. Just click on the brand name link to be sent directly to the application. On a scale of 1 to 10, how likely are you to reach out to a potential Swatcher/blogger if you see ‘available to swatch’ on the IG profile? The average here is an astounding 3!! Most said what tour profile says is not what is important. It’s the content and quality of the swatches that are posted. Makers also said they review the swatch/blog applications they have on file first. How many swatchers/blogger do you use per new release? Typically makers average 6-7 “core/regular” swatchers/bloggers per collection and then rotate between others on their “blog roll”. What are the TOP qualities you look for in a potential Swatcher/blogger? Enthusiasm/Realness/Effectiveness – Not every collection will be liked however, makers like to see some kind of emotion coming through a blog post rather than just mundane comments about the formula and other pertinent facts. Reviews don’t have to be long blog posts, but actual commentary on the important things, which include: brand name, name of the polish, polish application notes, how many coats it took to reach the look in the photos, and whether the item is already available or if it’s releasing soon with a date and time for the upcoming release. Most annoying thing a potential Swatcher/blogger can do? Pushy/rude swatch/blog requests – NO random and constant emailing and messaging. Most makers have an application link somewhere. Interested parties should take 5 minutes to find it and complete it. To the aspiring swatchers/bloggers out there, you can do this!!! It may not happen over night or even 2 months from now, but if you just keep at it, it is possible. Remember to be encouraged, everyone had to start somewhere. As long as its your passion, then it should never feel like work. Also, check out Tips and Tricks for more useful information. Disclosure: The questions above were asked via FB and makers emailed their response. The makers were advised they could omit responses from any question they were not comfortable with answering. The responses expressed are those of the makers and the makers alone. I had the fortunate opportunity to ask Symantha some questions that I thought would help shed some light on this powerful indie maker. Q: What is one thing your willing to share that your customers would be surprised to know about you? Q: In 5 words, describe yourself. Once again, thanks for hanging out with me today and I hope to bring you more interviews with your favorite indie makers. If you are a maker or know a maker who should be featured, please comment below. Disclosure: The questions above were sent to the featured maker (FM) for review and response. The FM was advised they could omit responses from any question they were not comfortable with answering. The responses are directly from the FM and have not be altered in any way, shape or form. The comments and responses expressed in this interview are those of the FM and the FM alone. Sun Polish arrived beautifully and securely packaged. The polishes are in rounded, square bottles with standard brush applicators. 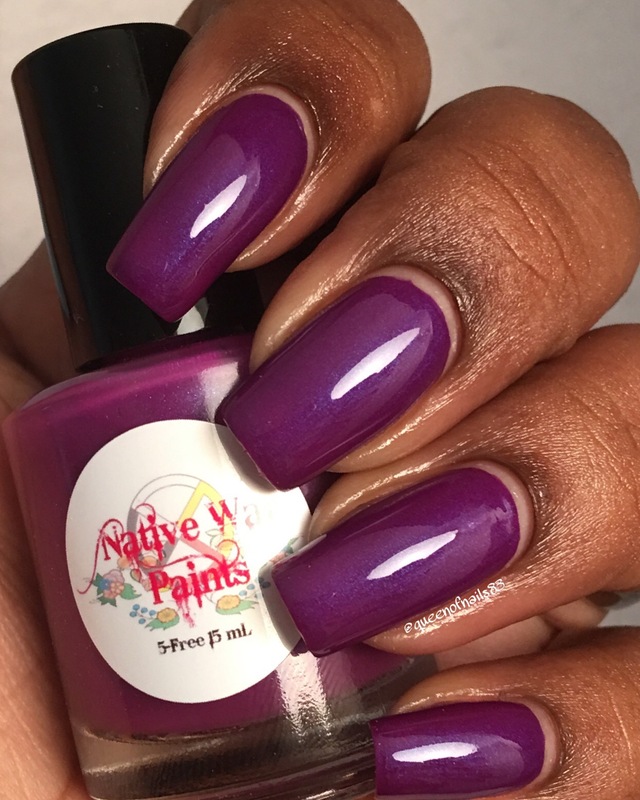 Currently, polishes are exclusively sold online and retail for $12. Sun Polish is made and only ships within the US and offers free standard USPS shipping. #5 is a deep, rich, dark navy blue crème. Shown here in 2 coats, this polishes dries shiny. The formula is consistent with other crèmes and is completely opaque in 1-2 coats. #17 is a pink, jelly, shimmer. Shown here in 4 very thin coats, this polish dries shiny. The formula is thin and applies and builds well. Although there is still some VNL (visible nail line), this polish could be completely opaque in 4-5 coats. I definitely see my self using these polishes more. #5 will be great for a future 4th of July mani and #17 would be perfect with a little black and white double stamping nail art. So tell me which is your favorite? As always, thanks for stopping by and hanging out a bit. I’ve decided that once a month I want to do a Swatcher Spotlight focusing in on an awesome swatcher in the nail community because without them we would be stuck deciding between the red holo and the red holo. I reached out to Nicole and asked if she would do me a favor and help get my blog off on the right foot by answering a few questions that I could use as an “interview” on my blog. I was ready for, “I’m not interested,” or “I’m too busy,” but that’s not what I got at all. Instead, she was willing, excited and agreed without hesitation. I am so super stoked that she did since now we have a chance to know more about our friend with the beautiful swatches. I started off asking Nicole some general questions about herself and she was open and candid in her responses. Ok, ok, now that we have the pleasantries out of the way, it’s time to have some fun with Nicole. See what she said when I asked her some fun facts! Now it was time to get down to business and talk nails because after all this blog is about nails. Q: You’re going on vacation for 2 weeks and can only take 3 bottles of polish (not included base or top coat). What do you take? Well there you have it folks, you read it here, directly from Nicole Perez. If you enjoyed this time with Nicole and would like to read more Swatcher Spotlights, let me know. Also, comment down below if you or someone you know is a swatcher that should have the spotlight on them!